This is the first post of my new Solo Travellers Series – that aims to introduce you to solo travellers from India and across Asia – who are challenging the solo travel norms in their own fierce ways. In this post, meet Mariyam Niuma – the first solo female traveller, surf photographer and couchsurfer from the Maldives – who is giving new perspective to the culture and women of the Maldives. [Update May 2018] Read the second post of this Solo Travellers Series: Meet the Courageous Indian Woman Travelling the World Solo – On a Wheelchair. 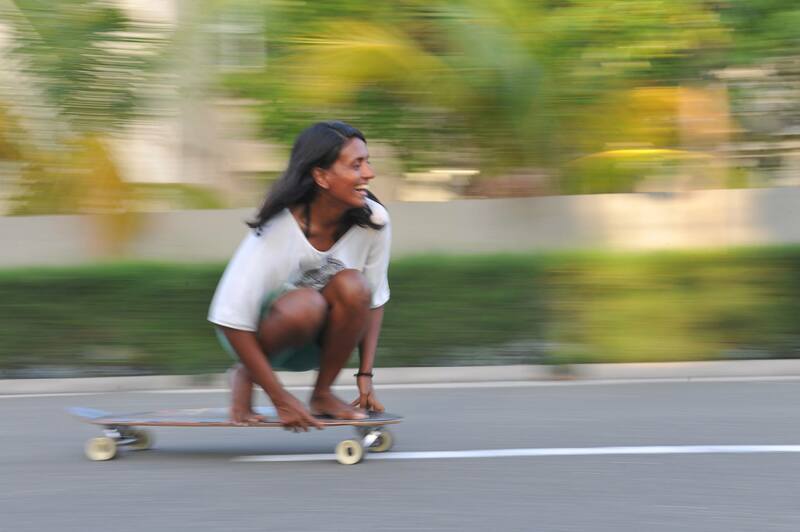 When I first met Niuma (Mariyam Niuma), she was renting a small house on a local island in the Maldives, spending her days surfing in the warm waves of the Indian Ocean. As she spoke of her laidback life, I began yearning to live out my hideaway island dream too. We were at the World Travel Writers Conference in the Maldives, where I was speaking on a travel panel about storytelling. We stole a few moments to chat about our recent adventures and the similar battles we had fought at home to chase our dream of travelling the world. But I never truly understood her battles until I spent a couple of weeks living in a small guesthouse on Maalhos, a local Maldivian island, a few months later. Unlike “resort islands” – private islands occupied by a tourist resort – local islands offer an intimate glimpse into daily life in the Maldives. It was on Maalhos that I realized that most Maldivian women, including young girls, are expected to fully cover up their bodies even under the hot tropical sun; that their ambitions are often limited to becoming teachers, though most of them only end up fulfilling the duties of a wife; that even though the pristine blue ocean is in their backyard, they are shy (and often not permitted) to join the boys and men to learn to swim, surf, snorkel or dive. Niuma’s love affair with the ocean began as a little kid, when on long ferry rides from Male to her father’s island village, she imagined herself as a mermaid! She has travelled solo across Southeast Asia, crewed a sailboat from Malaysia to Thailand, taken surf lessons in Morocco, crossed 96 islands on foot in the Maldives and honed her surf photography skills to become Maldives’ first female surf photographer. When I reached out to her for this story, she was sailing on a 45-foot catamaran on a two day adventure from the Maldives to India! Follow Niuma’s solo travel adventures on her blog – Somewhere Salty, Instagram and Facebook. Her tryst with travel began in 2004, when she won return tickets to Colombo on Emirates. She was so stoked by the win that she decided to fight her fears and go solo to Sri Lanka. She loved it, and eventually saved enough money to move to Sri Lanka for college, where she began experimenting with Couchsurfing on her travels – becoming the first Couchsurfer from the Maldives! Upon returning home, she scored short-term work gigs of six months to a year – with NGOs, environmental organisations and high-end resorts – and saved up what she earned to travel in between. She took courses in surfing and diving, and invested in professional gear for surf photography. This paved the way for her to live at surf spots in Pondicherry, Morocco, Sri Lanka and the Maldives, where she would learn surfing in exchange for her work as a photographer – and gradually begin earning a living as a surf guide and surf photographer. Back when she first travelled out of the Maldives, Niuma said she felt like she somehow attracted people who supported her dreams. But the more she travelled, the more she realised how different she was; everyone she grew up with was getting married and having babies and doing ‘normal’ things. Apart from the burden that society placed on her, being in the surf industry and working as a surf photographer and guide, came with many challenges. She didn’t feel accepted in the local community for a long time. But her work built her reputation, and gradually people warmed up to the idea of supporting a Maldivian woman who was making it on her own. Niuma had been wanting to dive and surf since she was a kid, but it was only at age 28 that she learnt how to swim! She couldn’t let her eye glasses get in the way of her dream, so she saved up for a laser surgery. She pushed her comfort zone to finally learn surfing at 32, despite the fear of getting injured in a foreign country as she travelled on her own. But going for a wave felt incredibly liberating to her, even if she got injured while surfing in Morocco and had to nurse herself back to health. Niuma: “Why do you want a certain thing in life? I want a life of adventure because it makes me feel alive instead of just living a life where you get up to go to work and that’s it, or you go on a holiday once a year and that’s it. There is a whole world out there, full of amazing experiences. Make connections, learn new skills on the internet (so many free resources), ask questions from people who are doing it. It doesn’t take a lot of money to follow your dream. You just need to put in a little effort and chase it proactively. Save up and start small. Your confidence will build for bigger things. Also read: Solo Travel: To Go or Not To Go? Back in 2011, when I first began to travel solo, it felt like a lonely space. I wondered if I was the only one crazy enough to venture out on my own – especially as a 20-something Indian woman. But over time, I’ve been lucky enough to cross paths with solo travellers from around the world, but especially from Asia. Yet in the online travel arena, non-white solo travellers continue to be a minority. In this new monthly blog series, I hope to share with you inspiring stories of solo travellers from across Asia, especially women. Growing up in protective families and a conservative society, our battles are different, yet not impossible to fight. If you know of solo travellers from Asian countries who, in their own ways, are challenging societal norms and choosing an unconventional life, please connect us! My island hideaway in Maalhos, Maldives. Have you ever gone on a solo trip? Why or why not? Thanks to Mariyam Niuma and Remya Padmadas for their inputs. Thanks; hope to share more such stories soon! Stunning pictures ! thanks for sharing n keep it up ! Thank you for sharing Ms. Nath! I vaguely remember an interview with a Malaysian motolady who took a motorcycle pilgrimage to some Muslim holy places. Unfortunately, I don’t remember either her name nor the motosite address. Few things that I remember: 1) the lady’s “regular job” is teaching at school; 2) that pilgrimage was not her only mototrip in Asia. Anyway, luck with this important and exciting project! Please let people like Ms. Mariyam Niuma share not only their travel experience but also the way they deal with their conservative envionment, their solutions on how to make it at peace (if possible). Sounds interesting! If you ever recall the name, let me know. In the meantime, I’ll try to google her story. Such an inspiring story! thank you for sharing it, and I wish all the best to Niuma!! Thanks for reading Sev; I think we can all use the inspiration from time to time! Great post on amazing female traveller ! Looking forward to read more such stories here !! More coming soon; I’m really excited about the next one too! Such an awesome story! I also learnt swimming at 28. 🙂 I discovered the joy of solo travelling at 35 and have taken a handful of solo trips since. Niuma is right. Pushing that envelope is the key. I too am very fearful when it comes adventures especially since I am a mom. Please keep sharing such inspiring stories! That’s amazing Amrit! Just goes to show that age doesn’t matter. I recently turned 30 and have wondering how to stir up my life again. You guys inspire me! Inspiring. Thank you so much for sharing. Hope to share many more stories of such solo adventurers! Felt so inspired meeting her too! Surf Photographer !!! Sounds so cool. I am not a solo traveler,but journey has really inspired me to experience it myself someday. Hi Shivya, I just loved this article. So beautifully written. I can’t wait to read more!! These types of stories inspire and appeal to women from all walks of life. Everyone who travels has a story. A reason for leaving the comfort zone called home in the first place. I had the pleasure of meeting Niuma personally. I spent 2 weeks with her on the 45ft catamaran (Sail Shantaram) that went to India. She is exactly as you describe. Such an inspiration to women all over. I just love her! I have a suggestion for a story of another inspirational young lady new to traveling if you would like I can send her details privately. Hi Lindi, so cool that you were on the same catamaran! I would love to hear your suggestion. Could you send me an email with her details at shivyanath@gmail.com – or let me know how I can reach you. Thanks again; I think hearing stories of other women and their battles can inspire so many more. Truly inspiring story. It will help me to conquer my fears. Honestly, I found this article very interesting and inspiring. Glad to hear that Anshul! Thanks so much for the feature, Shivya. Hope this helps someone else to follow their dreams too. And hope I get to meet you again one day 🙂 It is by reading about and meeting people like yourself that I get the courage to do what I do. Pleasure’s all mine, Ni! I’m so glad to finally get this series going 🙂 It was truly inspiring to meet you and spend time with you, and I’m pretty sure our paths will cross again! Maldives is beautiful place for solo travel. It is a very advantageous post for me. I’ve enjoyed reading the post. It is very supportive and useful post. i am impressed from this post. I haven’t any word to appreciate this post. Thanks for such post and please keep it up. Previous PostWhy Travelling in Japan is Like Nowhere Else in the World. Next PostVegan (and Vegetarian) Friendly Cafes and Restaurants to Indulge in Bangkok.